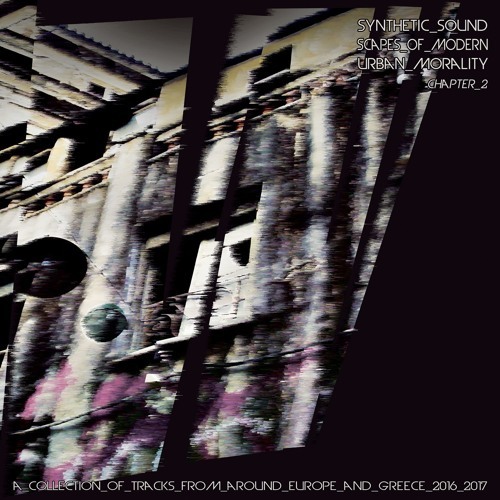 Geheimnis Records is happy to announce the release of “Synthetic Soundscapes of Modern Urban Morality / Chapter 2”. New bands and artists that are for the most part, in the early stages of their dreams. 5 of them come from Greece, while 4 bands come from Europe. In particular : “Misfortunes” come from Thessaloniki, Greece and is a one man-project. Ioakim Vasiliadis is the person behind the synths. He started back in 2014 and his affection for the 80’s analogue revival can be clearly heard through his compositions. This is his very first time on vinyl with two songs “Λέω Να Το Βάλω Κάτω" (“I wonder if I should give up”) and “In The Streets Of Our City”. “Dislocation Genders” is a duo project which also comes from Thessaloniki, Greece. Nick K. Maldoror is familiar to analogue synth enthusiasts all over Europe, since he was the one half of the late great “Human Puppets”. He has been collaborating with George D. since 2012 and this is the first time a song of theirs is released to the public. “Doric” of course is already familiar (Stathis Leontiadis – the other band member of “Human Puppets”) having already released the majority of his work on vinyl. The last couple of years he has had a closer collaboration with the fashion-designer-icon-singer Valisia Odell (Phoenix Catscratch, Strawberry Pills, Father Breath) who has given a more operatic and “cursed” aspect to his analogue-synth based music. The song included here, is very typical and reflects their good chemistry. “Neon Lies” is the one-man project of Goran Lautar who hails from Zagreb, Croatia. He started his solo project in 2015 and released a tape-album in October 2016. Haunted, whining vocals blended with lo-fi minimal synth sounds. The 2 songs that are included in this compilation are his first releases on vinyl. “Whispering Sons” are from Brussels, Belgium and last year released one of the most promising albums of the post punk alternative genre, “Endless Party”. Their guitar-based music incorporates dark and atmospheric elements mixed with anguished and nervous vocals that give an exceptional tone of well-balanced post punk. The song included on this compilation, first appeared on their debut LP. “Tisiphone” come from Lyon, France. The 3-member band is also a guitar-based act, dark and gloomy with a steady bass line, heavy rhythm section and a distinctive guitar. Last year they released their self-titled debut cd and their contribution here is from that album. “Mitra Mitra” is the brain-child of Mahk Rumbae and Violet Candide. They are based in Vienna, Austria and have been together since 2014. Mahk is a member of the “Oppenheimer MKII” project and “Konstruktivists”, as well as the “Codex Empire” solo techno project. Violet Candide originally hails from New Zealand. The version of their minimal/electro song “Opportunity” is available only on this compilation. “RATS” is a duo project, from Thessaloniki, Greece. Elias Papadopoulos has been collaborating with Iro since 2015 and they are heavily influenced by witchhouse, dark wave and industrial sounds. Last year they released a cd-album which received many good reviews from various webzines and music portals. Last but not least, “Paralogik” are the brain-child of Eugene B. (already familiar with his project included in our “No Radar” compilation, “Etherial Movement”) already conceived in 2014. With the help of Nick L. they have created a music hybrid, heavily influenced by dark-electro with more harsh and aggressive elements. Their work is released here for the first time. The compilation will be released in July 25th, 2017, in 300 hand-numbered copies, half of them on black and half on transparent purple. Vinyl mastering by Chris “Snake” Manolitsis.